Awww! I love animals. This is why this app is one of me top list. Even me parrot friend loves seeing the animals when I play this game. Wonder Zoo tis’ called. It lets this old bucko manage rescue stolen and injured animals and place them in me zoo. Aye, me very own zoo; at least on the game. This free game was created by Gameloft and can be played on iOS and Android devices. You may use your Facebook account to log on the application or create an account on Gameloft. 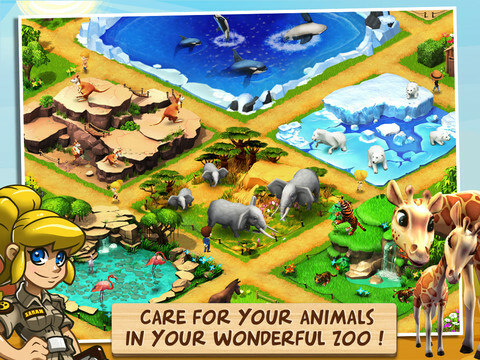 After downloading Wonder Zoo, start rescuing animals and placing them in your zoo. The first time you use this app, you will get the option to enable push notifications. But you can always turn this on and off anytime on your settings. Search for animals on one of the 5 locations available in the game. The first location that you will have access to is Savannah. Other locations will be unlocked as you progress on the game. Another way to get animals is to purchase them. You can then place them in your zoo. Buy habitats that are appropriate for your animals. Each habitat can have up to 4 animals, though you can have as many habitats as you want, as long as the size of your zoo can accommodate them. You may also purchase some decors that will make your zoo even more attractive. 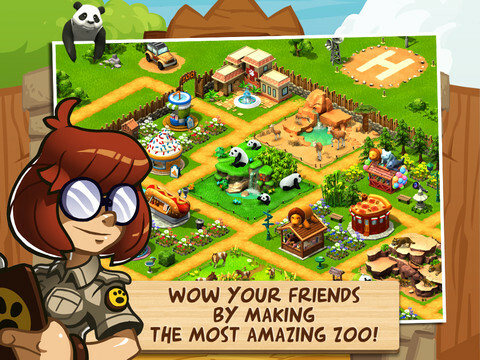 You will be given the option to expand if your zoo is already full. The maximum level that you can reach is 60. More options will be unlocked every time you increase your level. It also has goals that you may complete to earn experience and rewards. Breeding and crossbreeding animals is also possible. Wonder Zoo uses gold coin currency. This is what you will use in purchasing items like habitats and decors in the game. Some items can only be purchased using the premium currency, which is the peanut, including hard to find animals. You will earn gold coins when you log in to the game. Doing this everyday will earn you more coins. On the fifth day of consecutive log in, you will earn a peanut and a chance to win in the game’s lottery. The habitats will earn you gold coins. Completing achievements is also another way to earn coins, though you need to make sure that you select complete on the list once done with the challenge. If you do not do this, you will not get the rewards. However, you can always go back to the achievement list to tap complete. More coins and peanuts can be purchased on the game by tapping on the plus (+) icon next to the currency on top of the game window. Overall, this is an excellent game to play. The graphics, as well as the sounds are fantastic, adding to a great game experience. It allows you to interact with other players, so you can have fun with your friends, instead of just playing alone. It is enjoyable and addictive, especially if you want to get legendary animals that are hard to find and breed.